How is CPR Select different from other CPR/First Aid training sites? A. CPR Select has been in the safety training industry for years. We have a reputation and we stand by it. We offer nationally recognized safety training. Customer satisfaction is our #1 goal. There is a reason that over 95% of our clients return to re-certify! A. CPR Select follows the same ECC 2010 guidelines as the American Heart Association and the American Red Cross, making their certification nationally recognized and accepted. Our program has been developed to meet and exceed the set requirements. All students are fully protected by CPR Select's money-back guarantee. A. The average participant takes 1-3 hours to complete a course. Does the online course have to be completed in one sitting? A. No, our online training is set up so that you can learn at your own pace. Once registered, you will have 30 day's access to our training site to learn the material and take the online test. A. CPR/AED and Basic First Aid certifications are valid for two years from the day the exam was completed. Our Bloodborne Pathogens course is valid for one year from the exam date. Do you offer group rates or affiliation programs? A. Yes, please contact us to learn more. Is there a rush delivery CPR certification option? A. 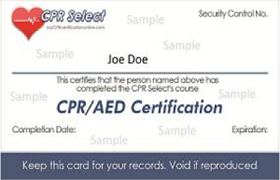 Yes, you will receive a digital printable CPR certification card with your name via email once you pass the exam. It is available for immediate printing. You may obtain this CPR certification card 24 hours a day, 7 days a week. There is no additional charge to have instant access to your card. Can I certify for the first time with this online course? A. Yes, our course can be taken for initial CPR certification. Our course is intended for anyone that requires CPR or First Aid certification. You do not need any prior knowledge of CPR or First Aid topics in order to become certified by the CPR Select. Can I recertify with this online CPR/ First Aid course? A. Yes, our course can be taken for CPR recertification. Medical providers and others who have obtained CPR certification in the past may recertify with our online CPR training program. We offer an up-to-date study guide written by AHA trained medical doctors and an extensive database of practice exams for those who would like to review any CPR topics before taking the exam. Can I get a refund if I am not satisfied with this course? A. Yes, you have 30 days to try our course risk-free. 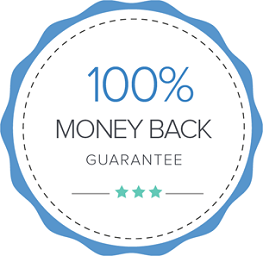 If for any reason you are not satisfied with our course, you may obtain a full refund as long as you request one before you attempt the certification exam. Your satisfaction is 100% guaranteed.